Narendra Modi brought BJP to power single-handed in 2014, cresting a promise to change the ethos of Indian politics and governance. He electrified hope. He energised India. With just months to go for his five year term to end, the man and his weather-beaten party machine stand reduced to niggling name changers. By the last-published count, 19 of the 23 Congress-led UPA government schemes sit soundly in new BJP led NDA make-up. The hackneyed ‘old wine in new bottle’ sums up the ruling BJP’s pan-India penchant, post-2014. From schemes to cities has been a short walk on a circuitous trail. Uttar Pradesh chief minister Adityanath’s high profile political polo of turning Faizabad into Ayodhya and Allahabad into Prayagraj at the inter-section of an RSS-orchestrated campaign for the Ram Mandir in a bid to hustle the apex court is now predictable poll politics. So Modi-led BJP government’s consent, so far, to the renaming of at least 25 towns and villages, across India in the past one year. It is selective poll politics, point out opposition leaders. West Bengal chief minister, Mamta Bannerji has already charged the Modi establishment with partisan ‘name-games’ and deliberate delay over her long pending demand for renaming her state as Bangla. Gujarat has now climbed the bandwagon as well, dusting off it’s old demand for renaming Ahmedabad as Karnavati. The Gujarat Congress has voiced it’s opposition to the move. "Ahmedabad is a historic city. UNESCO has given it the prestigious, Heritage City tag. The name Ahmedabadi does not denote a person staying in this city, it illustrates a way of life”, said state Congress chief, Amit Chavda, opposing the demand. Former union minister and Congress leader Shashi Tharoor, who was in Ahmedabad for a function, also expressed his concern over the name changings. "It is being done explicitly to places which are muslim in origin. What is the message sought to be sent to a community of our own country, that you have less stake in this society? Do they even understand the implications of what they are doing”, he agonized. Congress legislator Gyasuddin Sheikh, who represents Dariapur constituency in Ahmedabad, has threatened to launch a stir if the BJP government goes ahead with the move. "It is dirty politics and clearly a move to polarize voters ahead of the 2019 Lok Sabha elections”, points out Sheikh. The VHP, facing an identity crisis in general perception in Gujarat after it’s high profile international president, Dr Pravin Togadia, was ousted, is quick to issue a warning to those opposing the renaming of the city. "We hear that some Babur devotees are putting roadblocks. Let them be warned that the Hindus will end their political careers if they persist”, says Ashok Raval, state VHP chief. Togadia, who now heads a rival Antarrashtriya Hindu Parishad (AHP), laments that the BJP has forgotten it’s poll promise on both Ram Mandir and Karnavati. "It rules from the state to the centre, what prevents it?”, he questions. And so it goes on. The Ram mandir chess games notwithstanding, the Karnavati quest case study provides a detailed insight into how the Sangh Parivar set-up selects, builds-up and then fine tunes cleaving pen-poison issues to monopolise political control. All the RSS arms work in tandem to contribute in wresting political control for the BJP. Let's analyse. Gujarat’s queueing up apparently was on cue. On November 7, deputy chief minister Nitin Patel used the Faizabad-Ayodhya news peg to bring the cold-stored Karnavati issue back to life . "People desire it but there are legal limitations. If the law on renamings is changed, we are ready”, he said. 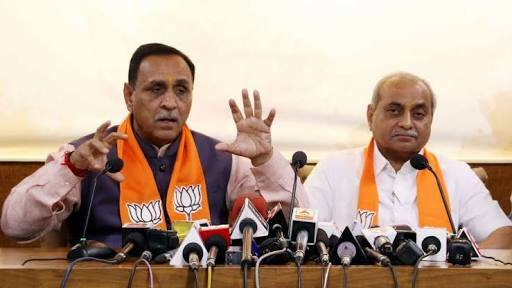 Chimed in chief minister Vijay Rupani two days later "We will take concrete steps towards it after exploring legal and other possibilities”, hinting at another engagement that it may come about before the 2019 polls. Another two days and the VHP-Bajrang Dal combine moved in to welcome the move and warn those opposing it. Soon the Congress opposition moved and so did all manner of men and women from a cross-section of society. And the lob and volley game was soon in full swing. Conveniently lost in this deliberately drummed up cacophony were pressing issues that showed the Rupani government in less than favourable light. The deepening agrarian crisis has led to 13 farmer suicide in less than three months due to crop failure, including a failed attempt at the chief minister’s own public meeting and three successful ones in the last one week, ending November14. All this in the chief minister’s own region of Saurashtra, which is reeling under acute scarcity conditions. The Cotton Association of India(CAI) projects a 16 per cent output dip to 88 lakh bales in 2018-19 as against 105 lakh bales the previous year, and to add insult to injury, farmers in scarcity-hit Surendranagar district have been notified to repay bank loans within a fortnight or face legal action. The Government of India’s own pocket book of agricultural statistics 2017 puts the average monthly income of a Gujarat farmer family at Rs 3,573 and states that 43 per cent of it’s 39.31 lakh agricultural households are in debt. And the state government’s lone claim to fame is an official panel to probe crop insurance complaints. The National Centre for Disease Control (NCDC) rates Gujarat as the third highest in swine flue cases in the country with 63 recorded deaths till November 5 this year. The number of diabetics are up 89 per cent from 4.8 per hundred adults in 1990 to 6.8 in 2016. The rise in obesity over the same period is 132 per cent. More data would be further unnerving. Gujarat’s public debt was less than Rs 10,000 crore when the BJP first came to power in 1995 and tripled during chief minister Narendra Modi’s reign to now rest at Rs 2,17,338 crore (2017-18). “Thus it is that the dismal state of Gujarat affairs needs distractions like the Sardar statue and now the Karnavati controversy”, points out former chief minister Suresh Mehta, adding, “It is in the familiar mould of ‘if you do not have bread, eat cake, keep looking skywards and squabbling amongst yourselves'." Mehta should know for he was the second BJP chief minister of Gujarat, and subsequently quit the party over differences with Modi. The fact is that the Karnavati controversy is about three decades old. Part of an expansion blueprint, it found implementation when the BJP came to power in the Ahmedabad Municipal Corporation and in May 1990 passed a resolution to this effect. Later in September 1995, the first BJP government in the state led by Keshubhai Patel passed a similar resolution in the State Assembly. According to the nomination document sent by the Ahmedabad Municipal Corporation to UNESCO in furtherance of it’s bid for heritage city status states that ”this land (Ahmedabad) was also in proximity to smaller, older existing settlements (…) as Karnavati”. As per the document Karnavati was not on the site of the walled city established by Ahmed Shah but on it’s outskirts in the south-west direction. In the 11th century the area around present day Ahmedabad was named Ashavali after a tribal ruler, so why not name the city so, asks an analyst, going on to answer, that it would not suit the narrative that the Sangh Parivar would want to build -- that of a Rajput warrior who patronized Jainism. The re-naming of Ahmedabad was part of a larger Hindutva project for Gujarat entrusted to the VHP to begin with. In Ahmedabad posters had sprung up in the eighties stating Hindu rashtra ke shehar karnavati mein apka swagat hai” similar signboards came up at the entrance of villages in Gujarat stating likewise for the village to buttress the Hindu rashtra identity. Town and village folk were encouraged to walk to famous Hindu shrines in key religious dates and ‘pag-pada sanghs’ were set up in residential housing societies of towns as well as in villages to band them into groups to undertake the walk. En-route villages would set up welcome and rest places where free food, snacks and tea were served as a larger philanthropic mission. The religious zeal was subsequently monetized electorally in favour of the BJP leading to the first BJP government in Gujarat in 1995, and except for a short power spell by BJP rebel Shankersinh Vaghela, continues unhindered to this day -- a period just two years short of a quarter century. The fact is that, after the BJP came to power, both in Gujarat and later in Delhi under Atal Bihari Vajpayee, and now Narendra Modi, it’s one time prime mover, LK Advani, who was union home minister for long, and in four years of his term Modi never bothered to raise the issue. It had, for all practical purposes, outlived it’s usefulness when power targets stood achieved. However, with the BJP on a shaky wicket viz-a-viz 2019 when an embattled Modi goes back for a mandate, ‘opiate’ issues like the Ram mandir and the Karnavati controversy are being stirred up again with clear, obvious electoral intentions. Notwithstanding the technical position in re-naming, the fact is that the move has come in for heavy trolling both in the social media and amongst enlightened citizenry who have made no secret of their opposition to it. 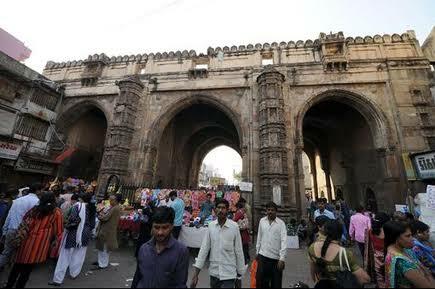 Even the state bureaucracy which had worked hard to get Ahmedabad, the UNESCO heritage city tag is unhappy with such a political move as it may come with costs. There is clear and inherent danger of loss, if the political leadership persists, the powers that be have been forewarned, say insiders.